Nominate a worthy person/charity for a free AEG Washing Machine. We need your help finding the most deserving recipient of this 100% FREE AEG Washing Machine. Do you know of a charity or person that is in need of a new washing machine, but doesn’t have the funds for one? If you do, this could be your opportunity to help them get what they need. 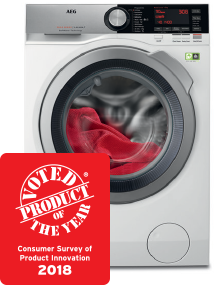 We are giving away one award-winning AEG 9000 series Washing Machine to a deserving nominee. We have all gone through hard times, whether it’s: health, family, employment or any other form of hardship. There are amazing people in our community who aren’t having the best of luck – and we want to do our bit to improve their lives. Which is why we have opened this giveaway up for deserving people as well as deserving charity’s. Our company is locally based – We all grew up here, we raised our families here and the community has done a lot to help us. So we decided to give something back. We are giving away one of the best washing machines currently available on the market today. This AEG 9000 series Washing Machine was voted product of the year by the world’s largest consumer-voted award for product innovation. It has a super-fast 1400rpm spin speed and a massive 9kg drum size. It’s one of our most desired products and we are really excited to be able to give this to a place that needs it. Submit your nomination before the 17th of July 2018. Every successful nominee will be assigned a number. One nominee can have multiple numbers if submitted by multiple people (so make sure to share this page with your friends and family). We will then draw 2 numbers at random. The numbers will be picked using Amazon Alexa’s random number generator. The successful nominations will then be contacted with further details. Keep an eye on your email inbox between the 18th-23rd of July. The 2 nominations will go to vote on our Facebook page on the 24th of July. The person/charity with the most votes by the 31st of July will receive the Washing Machine. Nominations must be based in a county where we have a Stellisons store (that’s Essex, Suffolk & Kent). Terms & conditions for this giveaway can be found here. So submit their details below, the successful applicant will receive the Washing Machine 100% FREE. And we will even deliver and install it at a time of their convenience for free too. Entries for this giveaway have now ended & nominations are going to vote on the 24th of July. Make sure to cast your vote on our Facebook poll to choose your winner! You will be updated with information regarding this giveaway as well as future giveaways, promotions & more.